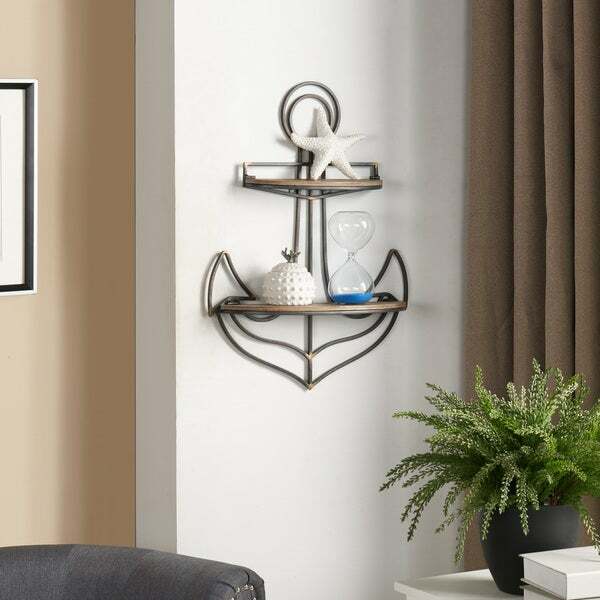 Showcase your nautical knickknacks on this anchor-shaped wall shelf by Danya B. Made of metal and natural wood, this shelf matches beautifully with distressed coastal decor. Hang it immediately with the included hardware. Contemporary nautical coastal style for any wall in your home or office. Cute shelf! This is for my daughters room and she loves it. It is well made and packaged securely. The outside box was damaged, but the shelf inside was fine! The wood is slightly distressed looking and metal is a grayish color making it perfect to go with most any décor. The Anchor wall shelf is for my guest room which is has a nautical decor theme going on. I like the size and look of this wall shelf, it fits into the overall look of the room... If someone is into the nautical look, yes I would recommend this shelf. Cute simple shelf that went with my decor, another Danya B win :) this hung on my wall very easily, my only wish is for storage I wish there was a way to lock the shelves flat with the anchor. right now they lay flat but as soon as you move it, they flap back down. This shelf is so perfect. I love that is has a “coastal rustic” feel to it. This wall shelf is a perfect statement piece. The color is gorgeous and the shelves fold up if you don’t want to use them. 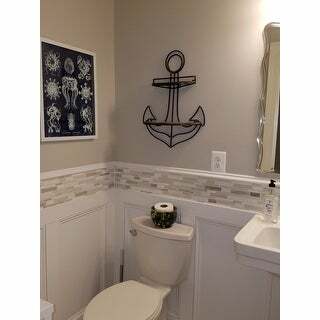 I brought this Anchor shelf to put in my bathroom.. it is the perfect fit & good quality materials were used . I highly recommend this item if your into Nautical themed decor!! So so cute! Love them! They accent my wall just right. The shelves are sturdy and the piece overall is really well made. The metal frame makes for a really cool accent!! I love nautical decor and searched ‘anchor’ and was surprised to find this item. I love that it has two little shelves that I can put other trinkets or small picture frames on. Looks just like the picture and fit in our space perfectly. Beautiful piece. Perfect match/completion for the boys living room "neverland pirates" theme. This anchor wall shelf allow space to add extra accent/decor. Perfect design. I plan to purchase a second piece for one of my son's room who is in love with Jack and the neverland pirates. Highly recommended. This shelf is fantastic and a nice size for my powder room. I absolutely love this wall shelf. It fits so perfect in my living room. It is well put together and is just beautiful. The shelves fold down, so it lays pretty flat when not hanging. It seems very sturdy. Really cute shelf, glad I bought it. love it!... it looks great on my wall. This wall hanging was just perfect. I needed something on this small wall that blended with the room and this was it. I love the 2 little shelves. It's nicely made. Shipped quickly and packed well. Super cute shelf! Perfect size for some of my skin care products. Compliments my bathroom perfectly. Did not come with screws to hang with, which was disappointing. Would definitely recommend. This item came quickly and looks amazing in my kids bathroom. It was exactly what I needed and ordered! Easy to hang. The shelves are not level and they cannot be adjusted. Poorly made. This shelf is awesome, unique and a great size! Although the shelves are small it is a perfect wall decoration for a nautical themed room! Excellent quality!!! "Will this be back in stock? " We just did our sons bathroom in a nautical theme and this is the perfect shelf for his bathroom. Good reviews and I really like it so I ordered one for my daughter for a gift and a gift for me!